The Theatre Company of Saugus is excited to announce our upcoming holiday season production of Nunsense: The Mega Musical. With book, music, and lyrics by Dan Goggin, it’s about a group of funny nuns who love to entertain. This is the expanded cast version of the first in the series of popular comedy musicals about the Little Sisters of Hoboken. Following a cooking disaster, the nuns must raise money to put the convent back in order. The sisters decide that the best way to raise the money is to put on a variety show, so they take over the school auditorium, which is currently set up for the eighth grade production of “Grease.” This expanded version of the show stars the nuns you love, plus some priests and brothers, and a bunch of Mount Saint Helen’s most talented students. 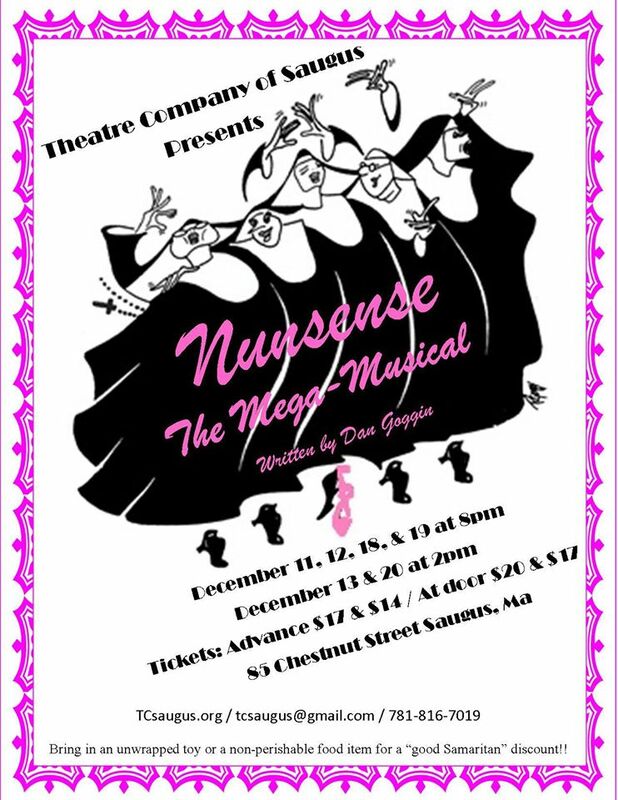 Performances of Nunsense: The Mega Musical are on December 11-12-13, 18-19-20, 2015. Fridays and Saturdays evenings at 8 PM, and Sunday afternoons at 2 PM. The venue is the East Saugus United Methodist Church at 85 Chestnut Street, at the corner of Winter Street, in Saugus, Massachusetts 01906. Seating is cabaret style, with refreshments available. See the Directions page. Tickets at the door are $20 for adults, or $17 for seniors, students, and children. Tickets bought in advance are only $17 or $14. Discounts are available for large groups, or for those who bring in toy or food donations. For complete information about purchasing and reserving tickets, see the Tickets page. The characters in the Nunsense series present a glorious smorgasbord of personalities that highlight both the ideal and the most challenging character traits in human beings. The magic of this series is demonstrated by the remarkable way that these very different individuals who share core beliefs can do God’s will while valuing each other’s unique gifts. No traditional habit can repress the tough Brooklyn attitude of Sister Robert Anne; camouflage Sister Leo’s love for the ballet; disguise Sister Hubert’s knack for maintaining order and perspective; mask Sister Amnesia’s endearing yet convoluted innocence; or corral Reverend Mother’s engrained enthusiasm for show business. Kind-hearted and fun-loving Father Virgil valiantly attempts to keep the show on track, with the assistance of Brother Timothy and Brother Donald. Eight talented students (the winners of the 2015 Mount St. Helen’s Ode Contest) are featured in this expanded version of the opening chapter of the Nunsense series. The audience is also introduced to two of the students’ favorite teachers, Sister Luke and Sister Brendan, as well as the convent nurse Sister Mary Wilhelm and the spotlight operator, Sister Mary Myopia. Sister Julia, Child of God, attempts to sell her cookbook, which (unfortunately) happens to contain her poisonous recipe for Vichyssoise Soup that (unfortunately) recently killed off 52 of the Little Sisters of Hoboken. Since the sisters only had enough money to bury 48 of the 52 sisters, they are putting on this benefit show to raise funds in order to give the last four sisters a proper burial. Although their differences are many, the characters’ common devotion to the Lord unifies them to strike a highly entertaining balance of human flaws tempered with divine wisdom. Even if you have seen Nunsense before, you have never seen it portrayed quite like this. The typical musical revue format of the show has been enhanced by re-enactments of the musical numbers, adding both humorous and poignant layers to the story. With typical Nunsense humor and chaos, the audience is provided with an explanation for this show, and is invited to help solve the sisters’ financial problems so that they may “Clean out the Freezer” and bury the last four dead nuns properly. The director of Nunsense: The Mega Musical is Becky Rush, from Pembroke, New Hampshire, who also directed last season’s successful production of Nuncrackers: The Nunsense Christmas Musical. The musical director is Joe Nuccio, from Lynn, Massachusetts. Kathleen Tringale of Lynn, is the choreographer. Mary Moffett, from Beverly, is the stage manager. We are proud to announce the cast for our upcoming show Nunsense: The Mega Musical!! We have a wonderful cast with a mixture of familiar and new faces!! Those returning in their same roles from last year’s production of Nuncrackers include Robin Linehan as Reverend Mother, Amanda Allen as Sister Hubert, Sherri Raftery as Sister Mary Myopia, Stephen Russo as Father Virgil, and the children Olivia MacKenzie, Anna Falasca, and Will Fafard. Kathleen Tringale, Phyllis Scalia-D’Eon, Bobby Imperato, Andrew Quinney, Mia Tringale, Lauren Pozark, and Mary D’Eon have all appeared with TCS in other shows. We welcome all the talented newcomers to our convent family!